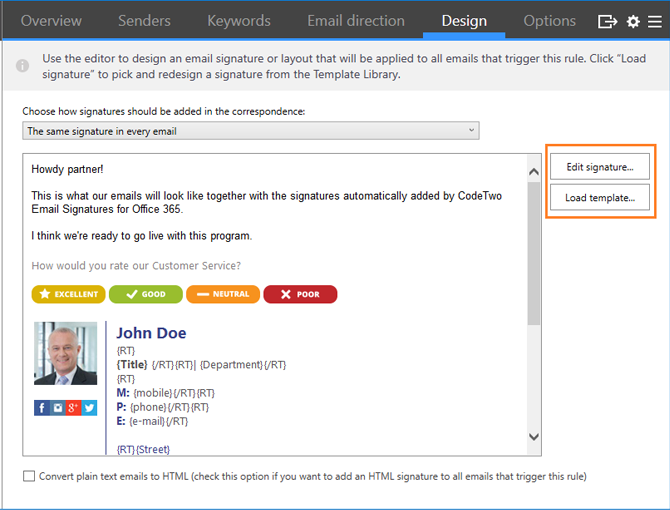 How to set up different email signatures for shared mailbox and user mailbox in Office 365? There are three options to choose from to add different signatures to user mailbox and shared mailbox emails. The first method is to create two separate signatures in Outlook, the second requires mail flow rules on the server side and the third involves the use of CodeTwo Email Signatures for Office 365. It is a common and widely-spread practice in a business email communication to differentiate signatures depending on who the sender is. Companies very often want to put different sets of contact details, images, and even layouts to indicate that the message arrives from a general mailbox like sales@ or from an individual like j.doe@. In Outlook, go to File > Options > Mail > Signatures. The Signatures and Stationery window will open. Under the E-mail Signature tab, in the Select signature to edit section, click New. Type the name for your shared mailbox signature and click OK.
Use formatting tools available in the Edit signature section, to create the signatures. 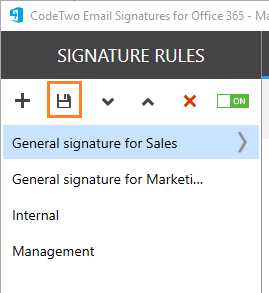 You can also prepare the signature in a signature generator and then just copy/past it into Outlook. 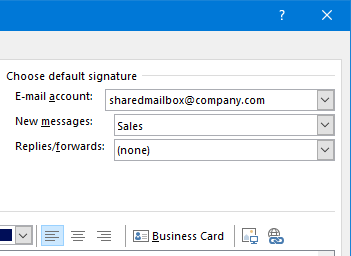 In the Choose default signature section, select the shared mailbox and define whether the signature should automatically appear in new messages, replies and forwards. Click OK to apply the changes. Repeat the steps to set up a signature for your personal account. Every time you write a new email you need to remember to manually select the shared mailbox in the From field and select the shared mailbox’s signature back and forth. Limited formatting tools and options in the signature editor. Relatively difficult to create advanced signatures (because of limited editor functionalities). Open Exchange admin center in Office 365. Navigate to mail flow > rules. Click the Plus icon and select Apply disclaimers…. a. In the Apply this rule if.. section, select your shared mailbox. b. 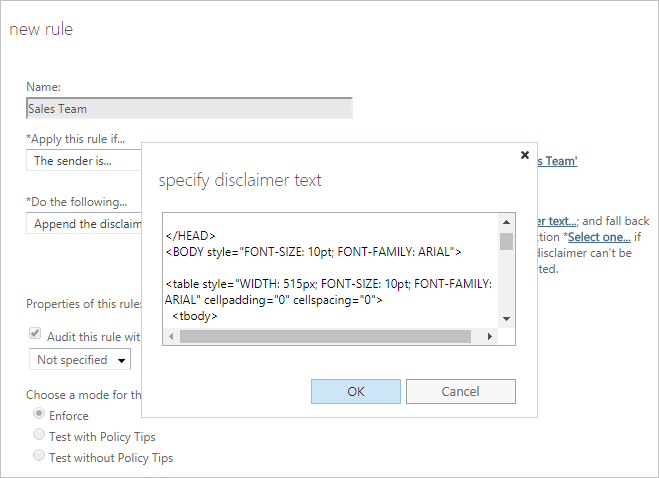 In the Do the following… section, enter the disclaimer text and select one of the fall back actions. Note: If you want your signature to look nice, you will need to wrap it in HTML code. If you don’t feel very comfortable with HTML coding, you can get some help from this signature generator. It’s free and allows you to convert one of the predefined signatures (filled in with data you provided) to HTML. If you don’t want the signature to show up on replies, click the link More options… and set up an exception to the rule, e.g. Except if… > The subject or body… > subject includes any of these words. In the following window type RE:, then click the Plus icon and OK.
Take a final look at the rule settings, and if everything is set up correctly, click Save. Repeat all the above step to create a signature for a user mailbox. Note: Keep in mind that a user sending from a shared mailbox will get either the shared mailbox or their own signature depending on how delegate rights are assigned to the user. If the user has the Send as rights to a shared mailbox, emails will be stamped with a signature created for the shared mailbox. If the user has the Send on behalf of rights, the signature specified for a user mailbox will be added. The rule is handled on the server side so there is no need to manipulate signatures on the client side. 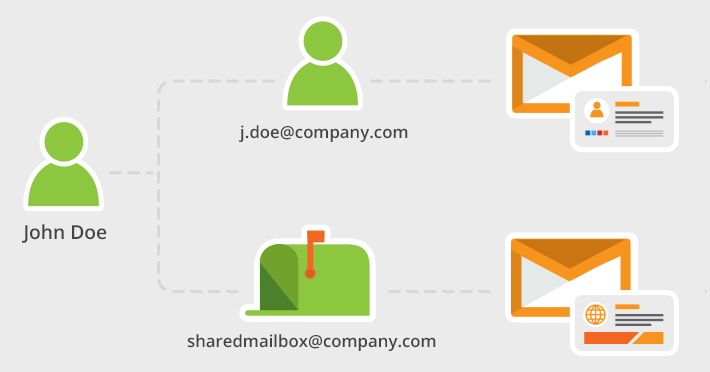 You can create both user and shared mailbox signatures from one place. You need to have at least the basic HTML knowledge to code fairly professional signatures. In replies, the signature will always come to the very end of the conversation thread. Note: To go with this method, you need a valid subscription of CodeTwo Email Signatures for Office 365. If this solution is new to you, you can sign up for a free 14-trial here. Log in to your CodeTwo Admin Panel account and go to Tenants. 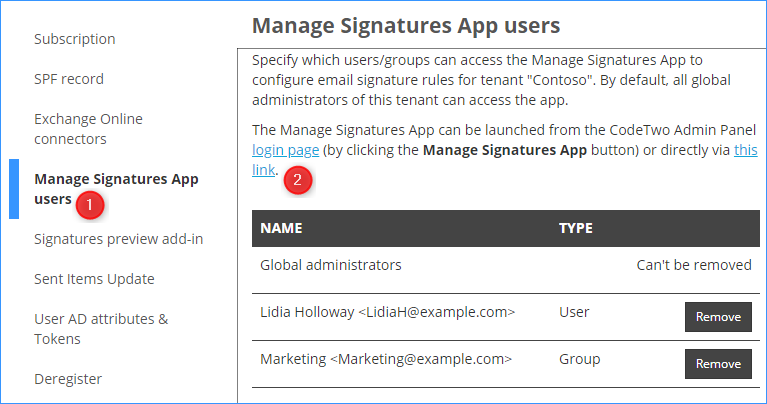 Select the tenant you want to set up signatures for, choose Manage signatures, and then click the link which takes you to the Manage Signatures App. In the Manage Signatures App, add a new rule and name it. In the Senders tab, select the shared mailbox address. Use the Add… button. Optionally, you can also set up specific keywords that will trigger or suppress this rule. Choose which emails you want to add the signature to. In the Design tab, click Edit signature button to create your shared mailbox signature or click Load template… to load one of the predefined email signature templates ready to use or adjust. In the Options tab, configure other settings. Once everything is set up correctly you can save the changes. Repeat the procedure to set up the signature for a user mailbox. Now all emails sent from the shared mailbox will be stamped with either shared or user mailbox signature, depending on the delegate rights of the sender. You set up signatures once and forget about it. They are added automatically on the server side. The users don’t have to switch between accounts to send emails with a proper signature. Each signature lands right under the reply, not at the bottom of a conversation. You can control all signatures in the company from one place. Bouns: CodeTwo Email Signatures for Office 365 comes with a free subscription of a backup and restore solution – CodeTwo Backup for Office 365. Find out more about this special offer here. You need to buy a subscription to be able to use this solution in your organization. For some hands-on experience, there is an option to try the solution for 14 days at no cost. For more details on adding signatures to Office 365 shared mailboxes, see this KB article.